I can’t tell if it’s a natural thing for every kid to like music, but I am certain that both my kids are music-lovers. As young as four and one, they’ve clearly expressed their love for music. I have witnessed how they enjoy listening to music and dancing and singing to some good songs. They like performing but they love it even more when they do it together. Zooey likes singing and her favorites include the ever popular Frozen songs – Let It Go, Do You Wanna Build A Snowman, and For The First Time In Forever. Though she can’t speak every English word correctly, I like listening to her sing passionately since she has memorized the lyrics by heart. On the other hand, Zion takes so much pleasure in dancing. He is very delighted when he hears ANY kind of music. I’m not kidding when I say he dances to every tune. YES, I swear that he will dance when he hears all sorts of lively sound, from that single drum beat passing by our house, to simply hearing my mom’s phone ringtone, or even those short TV commercial jingles. He gets easily excited and dances happily. I am amazed and thankful that my kids appreciate music at a very young age. Watching them have fun whenever there’s music is always a wonderful moment to savor. 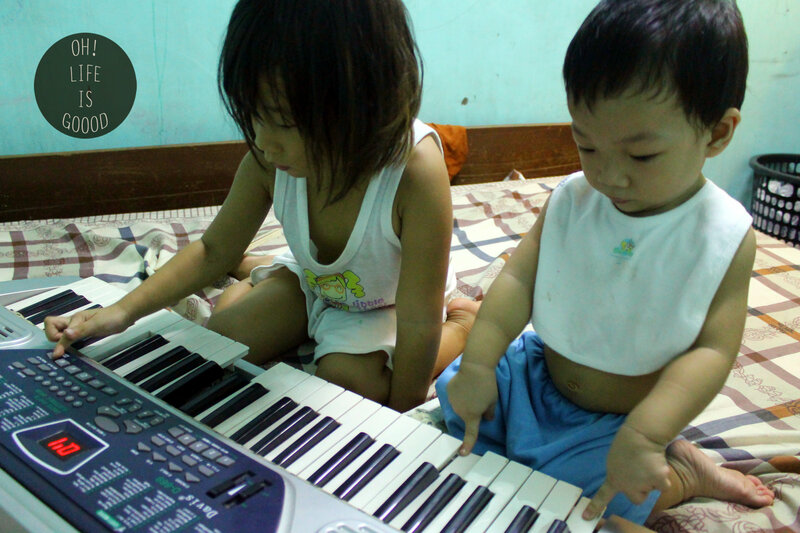 I especially like it when I see them playing with our keyboard instrument and trying to work together to produce their own melody. It’s one of my most favorite scenes of them which truly melts my heart. I’m glad to know that music pleases my kids like it does to me. Personally, I am a big fan of good music and I enjoy listening to most genres like acoustic, alternative, punk, rock, pop, rnb, reggae, and some rap songs. Music is one of my sweet pills during bitter moments. Listening to my favorite artists help soothe every inch of my nerves and helps me calm down in times of stress. It relaxes me, builds my confidence, and quickly boosts my mood. I listen to music almost every time but I don’t always sing along. Though singing isn’t my talent, it’s actually my go-to thing whenever I feel great. I just feel the happiest whenever I sing. At home, “music time” is OUR most favorite bed time fun. It’s the time when I turn up my phone so loudly to play some music and all three of us, Zooey, Zion, and I, dance in bed. We dance crazily, wildly, gracefully, and joyfully all at once. It would usually last up to four to five songs, then “wrestle and tickle time” follows shortly. Music is indeed life. It’s in the core of our system which adds goodness to our lives. Whenever I feel sad, lonely, bored, happy, excited, or inspired, I know that there’s always a particular song that understands my feelings and relates to my situation. I’m sure a lot of you guys already realize how music affects your life, but for those few people who aren’t into music, I recommend that you make it a hobby to listen to good songs. Listen and live in the moment. Life is good, my friends, especially when you turn on that good music.